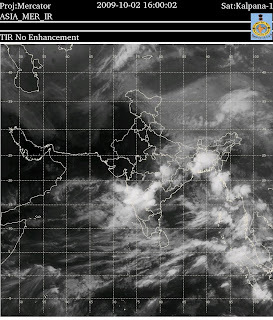 · The well marked low pressure area over Telangana & neighbourhood persists. · Fairly widespread rainfall activity with isolated heavy to very heavy falls is likely over Orissa and Andhra Pradesh during next 24 hours and will decrease in Andhra Pradesh thereafter. This is an historic record floods situation in Tungabhadra and Krishna rivers flowing through Parts of Maharashtra, Karnataka and Andhra Pradesh States in India. Andhra Pradesh is at the receiving end. Kurnool town, Vijayawada and hundreds of villages along these rivers and tributaries are under threat of sever losses to humans, animals, crops and movable and immovable assets, cultural, physical, natural capitals. This night is critical, still it is raining in parts of the State and in these basins too. Hope the losses remain low and all the relief and rehabilitation measures help these thousands of people. · The well marked low pressure area over westcentral Bay of Bengal and adjoining north coastal Andhra Pradesh & south coastal Orissa persists. · Fairly widespread rainfall activity with isolated heavy to very heavy falls is likely over Orissa during next 24 hours and over Andhra Pradesh during next 48 hours. Till recently people especially in parts of Andhra Pradesh experienced severe drought, the Kharif crop was at loss, now the people having cotton, pigeon pea, paddy, etc. crops standing are at great loss due to heavy rainfall since last 3 days and would continue for next one or two days. This is due to low pressure. The farmers are at great loss due to these days for the loss to the standing crops. Fifty children from 10th Class, Sri Aurabindo International School, Hyderabad have attended the "Environment and Leadership Camp" conducted at Champak Hills, Jangaon. Dr. N. Sai Bhaskar Reddy, GEO has designed and coordinated the camp with the support of staff from the school. The children got exposed to the impacts of drought, by observations, interviews with farmers and studies of the media. They have presented the posters at the end. This was a unique experience for the children. Life of a farmer is not cumulative values of rainfall, but the type of crop, amount of rainfall, spread of rains, breaks in rainfall, etc. in relation with other elements of nature, meteorology, etc. Things have not changed much, Telangana could be the worst affected area in the whole country. Al though there are few rains this week, we have lost opportunity for many crops. The cotton and redgram could have some benefit of rains. Drought 2009 cause and what can be done?! · National Rural Employment Guarantee Programme – Deviation of labor for indirect natural resources enhancement activities rather contributing to the direct production activities. This has lead to Non availability of labor or uneconomical to hire them. Although the Andhra Pradesh state government is spending lots of money for the irrigation projects, but the lack of rains and water source impacts all. Each family has optimum number of pots for water collection based on the usage and interval of supply as in case of drinking / domestic water supplied at household level / community taps. The number of structures being planned for recharge, retention and reuse, as mentioned (in the coming book of Frank van Steenbergen) are not being done on scientific basis. In the process false hopes are created for the people. As a result, it is like people are waiting at the taps with empty pots, unsure of the quantity and the timing and also they are not prepared for the untimely surplus. The seasonality is disturbed due to the climate change factors in many parts. In Andhra Pradesh the traditional seasonality has been disturbed, so the sowing. More over the seeds are not traditional they are Hybrid / genetically modified and has very less relationship to the seasonality of weather factors. 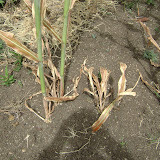 The misinformation by the responsible agencies regarding the rains is another major cause of failure of crops. Due to intense communication media, farmers are able to get the information from the weather announcements. This year monsoons arrival was predicted ahead of the normal time, the depressions occurring and the rainfall estimates were wrong, so farmers have made mistakes. IMD did not consider the el-nino impact on the Indian monsoon, if they have declared this year a very low rainfall year, people could have shifted to low water consuming crops / would have stopped sowing. Billions worth seed, inputs and the labor is lost. c. Stop unnecessary spending on the cultural / social events – festivals, marriages, etc. d. Be united rather being in nuclear / dis-jointed families. Document the happenings to understand the impact and support the administration and civil society. Create large scale awareness among the policy makers, farmers, etc. In this map the rainfall deficient areas extend to new areas, covering tamil nadu and North Karnataka. Overall the drought situation is worst in parts of Andhra Pradesh, especially in Telangana. The farmers identify this drought similar to the one happened in 1972 also called "Nukala Karuvu" because they remember that Government has supplied them broken rice as relief measure. They also remember the supply of cloth very cheap. Some of the people have sold their gold to cope with the drought, mainly for buying food for survival. The people also purchased the fodder travelling long distances on bullock Carts. The crops (jowar and maize) have dried up in majority of the fields around chevella. June to 09 August 2009 has been 28% below the Long Period Average (LPA). 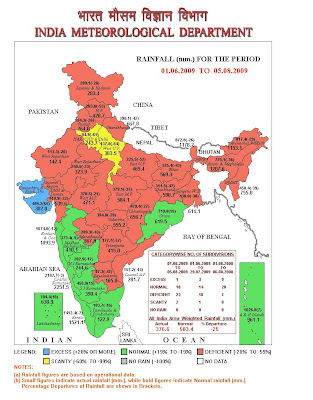 Progressive week by week cumulative rainfall departure from LPA during monsoon season 2009 for the country as a whole and over the four broad homogeneous regions of India are given in Table 1. Out of 36 meteorological sub-divisions, the cumulative rainfall during 1 June to 09 August has been excess/normal over 9 and deficient over 24 and scanty over three (West Uttar Pradesh, Haryana, Chandigarh & Delhi and Telengana) sub-divisions. The sub-divisions with deficiency of 50% or more include West Uttar Pradesh (-67%), Haryana, Chandigarh & Delhi (-64%), Telangana (-60%), East Uttar Pradesh (-53%) and Rayalaseema (-50%). The southwest monsoon activity is likely to improve during current week as the axis of monsoon trough has shifted southward and currently lies near its normal position running to north Bay of Bengal. 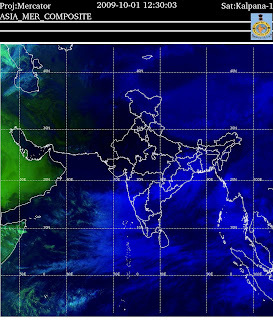 An upper air cyclonic circulation lies over northwest Bay of Bengal and adjoining Gangetic West Bengal and north coastal Orissa, extending upto midtropospheric levels. With the above scenario, fairly widespread rainfall with isolated heavy falls is likely over central and eastern India during next 2-3 days. The rainfall activity is also likely to increase over plains of northwest India and adjoining Rajasthan from 12th onwards for subsequent two to three days. numerical weather prediction (NWP) models based on latest data, forecast of rainfall during the month of August is revised to 90% ( ± 9%) of normal against earlier forecast of 101% and seasonal forecast (June to September) is revised to 87% ( ± 4%). Farmers fear that this year could be like 1972 when the drought happened. Affecting 52.6% of the area and Per Cent Departure (–) from Normal Rainfall is 23.9%. This year is unusual regarding rainfall at least in parts of Andhra Pradesh State. Effecting the standing crops, almost farmers have lost more than 50% of the crop in the fields. There is little scope for recovery in spite of hopeful rains in the coming days?! The number of rainy days, timeline of rains and the quantity of rains are responsible for drought. This time the information provided by the various relevant departments has also lead to cause of drought. Early arrival of monsoon and the depressions prediction caused the farmers to take decisions which were detrimental to them now. If they have not sown they could have saved all the seed, input costs and labour. Secondly, if they have followed their own traditional system and not following the responsible departments advices / media attention, probably they could not have been at such a loss. Farmers are asking who is accountable for misinformation? If at all any predictions went wrong they want the same department officials to come before the media and explain them why and where things went wrong and they could not predict exactly, inspite of their so many years of experience / expertise and using all the super computers. If farmers go by information and still drought occurs, this drought could be called as "Information drought" and let us accept it. Because millions of farmers have access to information from the media now. Founder and CEO, Geoecology Energy Organisation [GEO], has been contributing to climate change mitigation, adaptations, environmental sustainability, energy, terra preta and development aspects.